With the ability to blend pop country sensibilities and traditionalist country sounds, push progressive social viewpoints, and flaunt kitsch, nostalgic western wear like no other, Texas raised, Nashville based breakout singer Kacey Musgraves bucks convention in the mainstream country world, and seems the obvious heir to the new Nashville country crown (we hold plenty of more subversive new country artists in similar regard, but none have achieved quite the same level of mainstream recognition as crossover appeal as Kacey as of yet). It’s been nearly three long years since Musgraves’ lauded sophomore effort, Pageant Material, and though the gap was filled by an extremely charming and instant-classic holiday effort, A Very Kacey Christmas, we’ve been patiently awaiting another proper full-length. 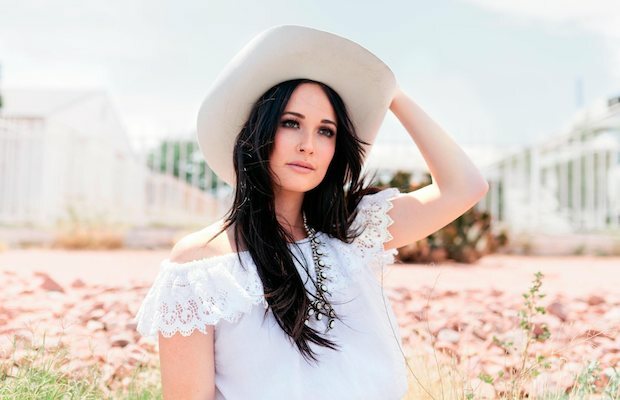 It had been teased for months, but Kacey’s latest, Golden Hour, finally got an official date, tracklisting, art, and a first taste, when a pair of new singles, among her strongest to date, “Space Cowboy” and “Butterflies” arrived last week. Set to drop March 30 via MCA Nashville, Golden Hour was co-written entirely by Musgraves, who co-produced as well along with Daniel Tashian and Ian Fitchuk. Inspired by being in a “golden hour” of her personal life, the newlywed singer opted to explore a trippy new direction, and embrace more of the rock influences she’s always harbored to some extent in her sound. The ethereal “Space Cowboy” feels almost like a twangy Jenny Lewis tune, fusing Kacey’s raw, melancholy earnestness and pop accessibility, giving it the spirit of classic country with the vibe of more contemporary pop. “Butterflies,” similarly, feels incredibly raw and personal, though in a more charming and cheerful way, landing as a very lovely, upbeat chronicle of budding love and vulnerability. Together, the pair of tracks chronicle the end of a relationship and the start of a new one, setting the table both narratively and thematically for what’s likely to be Kacey’s most mature- personally and musically- and adventurous album to date. In support, Musgraves stopped by The Tonight Show Starring Jimmy Fallon earlier this week to perform an absolutely stunning rendition of “Space Cowboy,” leaving us even more excited about her forthcoming release. You can watch that outing, and also listen to “Butterflies,” below! While no headlining shows are currently on the books, Kacey is set to support Harry Styles June 12 at Bridgestone Arena.